Lapland has much potential to grow in business. One important thing when a company aims to grow is to know the competence and the qualifications of its workers. In addition, companies should know where their branch and the world is going, and what competences and expertise they should have – say – in five years. Many times this is not the case, especially in small and micro companies. Work is hectic and the managing directors are usually very busy lacking the time to think the future in strategic way. In EKKU project (Ennakoinnista koulutukseen ja kumppanuuteen – From the anticipation to training, education and companionship) there have been made company interviews in Lapland with C&Q-system (Competence and Qualification). The process of the interview does not take very much time from managers of companies but the information that the interview gives is essential when considering the workers’ expertise and competitiveness of their business. First, the manager needs to tell all the acquirements, knowledge and attitudes of the professional groups that are most crucial to do the job well. Then they will give values to those skills, from one (not that essential but good to know) to five (absolutely important to successfully manage the job). The manager also estimates how well the professional groups master those skills needed. There is also a question, what kind of competence will be needed in the company in 1-2 years and in 5 years. The interview is then put into the C&Q-systems, which is a large database and the report that the system returns tells the possible lacks of skills and hidden knowledge and expertise. For example if a truck driver should have quite good skills, for example 4/5 in 1-5 scale, in repairing the truck but he requires the ability and the manager estimates that his ability is at level 2, there is a gap of -2. Then it would be good to give training to the truck driver so that his skills would correspond the needs of the job. Many managers who have given their time to this short interview, have said that this is the first time in a long time they have actually stopped for a while to think about what kind of competence, attitude and expertise their workers need. Lapland UAS can also provide education plans for the workers and even offer the education needed in some cases, for example in management. In the project, there are also two education organizations of the secondary education (Vocational College Lappia and Vocational College of Lapland), which can offer lower education – like preparing the truck – in addition to the supply that Lapland University of Applied Science can offer. In the project, there are also possibilities to make a larger development plan for the whole company and innovation programs to develop something totally new for the company, like new products or services. In the best situations there will be a long-term companionship born between the companies and the schools. The aim of the project is that all of Lapland would benefit and gain to keep up in development. Furthermore, because the project is taken care of by the education organizations, the students have taken part in it. The business economics students of the Lapland UAS received some reports of the skill gaps in different branches and made suggestions in small groups for the proper training and education to increase the competence and qualification of those branches in Lapland. 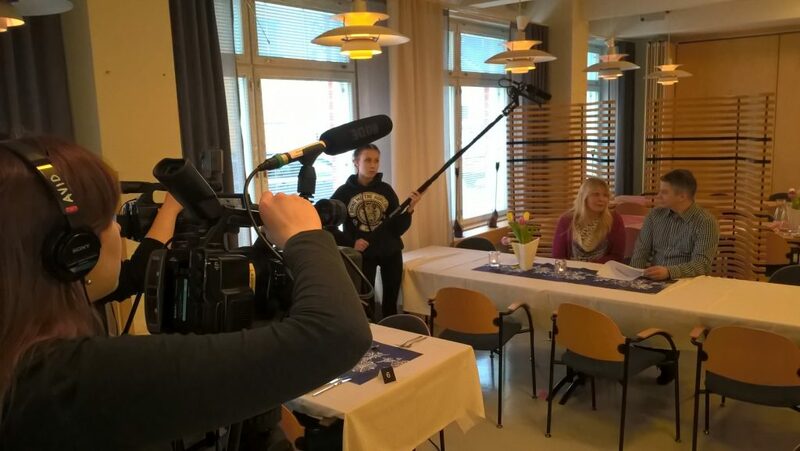 In the picture below, the students of Vocational College Lappia are making a video of the companionship agreement between a company and the Vocational College Lappia. EKKU project is funded by the Centre for Economic Development, Transport and the Environment of Norhern Ostrobothnia European Social Fund and is lead by Vocational College Lappia. The Project will end at the end of February 2018.